The development towards Europeanization of innovation policies and its consequences is poorly understood. A major literature exist on the internationalization of economic activity (including R&D) at the corporate level, but few studies focus on internationalization of greater innovation systems because the main focus has been on institutions at the national level. An obvious reason for this is evidently the infancy of innovation policy development at the international level, now about to change with the recent policy development observed within the European Union. 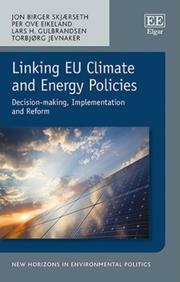 When adopted in 2008, the European Strategic Energy Technology Plan (SET-Plan) constituted a new low-carbon technology push policy at the EU-level. The plan aimed at accelerating innovation in new energy technologies for a low-carbon future and put EU technology industries at the forefront internationally.The EU SET-Plan represented a step forward for co-ordination at the EU level of national and industrial energy R&D resources to create critical masses of activities and actors needed for accellerating innovation in selected priority technoloiges. This loosening of national control is an interesting puzzle, since EU member states have viewed technology policy as a crucial strategic instrument to support national industrial development and competitiveness. How can we explain why the SET-Plan came into being and developed as a common technology policy that selected specific industrial initiatives at EU level? How can we assess implementation of the SET-plan and its performance according to SET-plan goals and wider EU energy and climate goals? How can we assess the consequences of the SET-Plan for Norway and Norwegian industrial strategies? The project aims to advance analysis of what role politics play in ithe ongoing efforts to establish an EU-level system of innovation in low-carbon energy technologies. Analytical frameworks are developed by combining EU policy development- and systems of innovation studies.